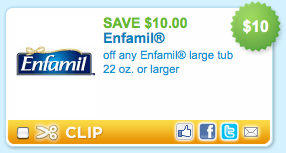 Head over to Coupons.com to print a high-value $10 off any Enfamil large tub, 22 oz. or larger, coupon. Use zip code 90210 if needed, and look under the “Baby” category to find it more quickly. This coupon will definitely help save on the cost of formula!